Bard Music Player is an automated music player for playing MIDI songs in FFXIV using the Bard's Performance mode. This program allows you to automatically play pre-made MIDI songs for the in-game instrument performance feature in FFXIV. In addition, it provides many more useful features such as: playlist, searching, note preview, lyrics, piano input, chat logging, and orchestra mode (multi-performer). If you have ANY problems, please read the manual first. Download the latest BMP release. Unzip the archive and place the executable somewhere. 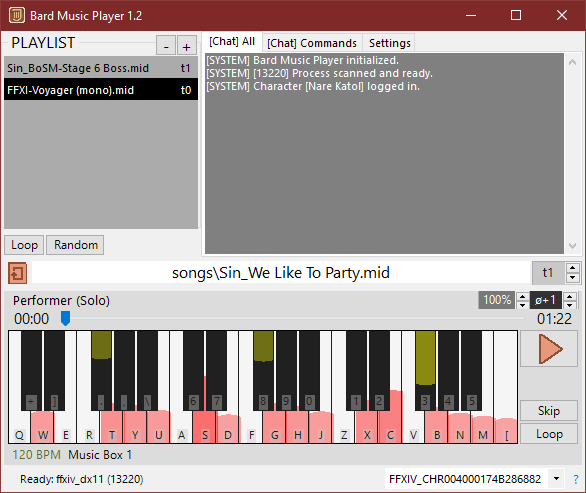 Create a directory next to the executable called "songs", and place your MIDI files in there. Set up your game correctly as instructed in the manual. Load the MIDI file, bring up performance in-game, and then play. Please note that this player's purpose is to only play back MIDI files. It does not automatically adjust, fine-tune, or arrange them to work flawlessly in the (already quite limited) bard performance. Either learn to edit the MIDI files to play correctly, or check out the Midi Repository. Bard Music Player (c) paru 2018 - proudly created at Ultros!